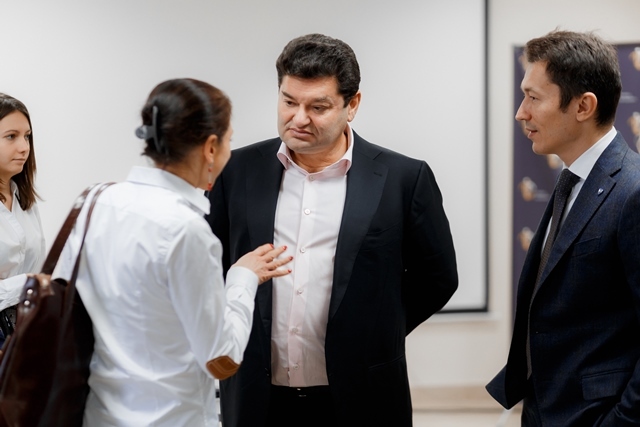 Vadym Iermolaiev is the owner of several dozen manufacturing enterprises, which has created more than 7,000 working places, and the owner of companies that are in the TOP 100 taxpayers of Ukraine. He regularly appears in the workshops of his own enterprises, but extremely rarely in the media space. But today, as an exception, he agreed to meet and truthfully answer even the most pressing issues related to his business activities. Why do you so rarely make contact with the press? I put my work first. I was brought up this way. Communication with the press is not my job and distracts from what I consider the most important. And for me, business management and communication with family is important. There is simply no time left for the rest. There are many publications online that accuse you of smuggling and fraud. Why don’t argue with them? Almost every time such a publication appears on the network, people come to me with a proposal to remove it for money. It’s just such a form of extortion. I always refuse extortioners, so lately such publications have declined. Although there are other situations: recently my lawyers brought to justice the author who spread such slander and did not demand anything from me. But during the trial, he frankly admitted that he had been paid money for posting false information about me. I know who it was and why, but let it remain my secret. But the accusations of you were sounded not only within the press. In 2014, the National Bank of Ukraine, decided to introduce the temporary administration in Aktabank, directly pointed out violations in the sphere of money laundering. You want to say that there were no violations in the bank? Aktabank are not as obvious as the National Bank officials would like to show at all. In terms of financing the bank was completely in order, until the NBU decided to ban cash transactions and currency transactions. These decisions were widely reported in the media, and this led to the outflow of bank depositors. The most serious violations for which the bank was punished, according to the act of inspection, was the absence of 15 copies of some pages of passports of bank customers. And at that moment the bank had more than 88 thousand customers. Since the decisions on sanctions were taken not by the NBU Board, as required by the law, but personally by the chairman and the currency commission of the National Bank, the court of first instance found them illegal. After that, I met with the Management of the NBU to agree on a way to bring the bank out of the crisis, but they made it clear to me that the bank would be liquidated no matter what I did. We won the trial from the National Bank in all instances, but, unfortunately, this did not stop the liquidation of Aktabank. So were there money laundering operations in the bank or not? Of course, those things that the National Bank and the yellow press wrote about were not in the bank. After the publication of reports, more than five investigative groups from different bodies turned the bank inside out and were personally convinced that it was a lie. In fact, this is a continuation of the same story. In the package of documents that the European Central Bank considered before revoking the license, there were a lot of messages from the National Bank of Ukraine about the signs of legalization of “dirty” money in “Aktabank”. At that moment, it was important for Estonia to demonstrate its determination in the fight against money laundering. And our small bank was a convenient target for demonstrating such a determination. The taking away of its license did not significantly affect the financial stability in Estonia. And the taking away of licenses from banks, which were in fact seriously involved in laundering schemes, would have caused a severe banking crisis. Reports of the National Bank showed that Ukraine will not protect its investors. Therefore, the ECB revoked the license of Versobank, writing in a decision that this measure is needed to demonstrate the possible consequences to other banks. But you dispute the ECB’s decision in the European Court? Yes, I do not think this decision is fair. The bank did everything possible to comply with the requirements of the legislation on the legalisation of illegal money. But European justice is not in a hurry, so we will have to wait a few years for a decision. After the loss of banking institutions, where did you concentrate your efforts? I focused on my favourite business – construction. More than ten years ago we founded the Alef Estate Company. Its goal is to decorate the city and make it more beautiful. We managed to implement such projects, in which it was even hard to believe at first. extension of Katerynoslavsky Boulevard. When implementing the project, several surprises are planned for the residents of our city. implants as Switzerland and Germany, or even better. In general, new ideas and projects appear constantly. I am like a barge – I cannot move forward without a load. Regarding the production of implants, was it difficult to implement such an atypical business for Ukraine? There were some difficulties. It was not possible to find specialists in the Dnipro who could work with CNC machines. Therefore, we created the necessary staff ourselves — we sent our employees to study at German factories. The road will be handled by the walker. Any difficulties can be solved, it would be only a desire to work on it. Why are most of your projects related to the Dnieper? I was born and raised in Dnipro. I love my city and I want to make it better. There was never a desire to move. Why look for a place where it is better if you can do better where you were born? In recent months, you have become more active in communicating with the press and speaking in public. Is this related to political ambitions? Do not you plan to be active in politics? I am not going to be active in politics, unlike many large Ukrainian businessmen. I focus all my attention and strength on business, and I understand that if I am active in politics, my favourite businesses will suffer from this.